Chimalhuacán (in nahuatl “place of those who have shields”) is a city and municipality located in the eastern part of State of Mexico, Mexico. It lies just outside the northeast border of the Federal District (Distrito Federal) and is part of the Greater Mexico City urban area. The city is practically coextensive with the municipality. The census of 2005 reported a population of 524,223 for the city and 525,389 for the municipality as a whole. Chimalhuacán was founded 1259 by three chiefs or tlatoani named Huauxomatl, Chalchiutlatonac and Tlatzcantecuhtli. These chiefs and their people originated from Tula and Culhuacán. They spoke Chichimeca y Mexica languages but with time their customs merged and Náhuatl became the dominant language. It became subject to Texcoco, and through that belonged to the Aztec Triple Alliance in 1431. The Spanish town of Chimalhuacán was founded in 1529 and the Dominicans built a church and monastery here in 1563. Although the city takes up almost all of the municipality, Chimalhuacán, as the municipal seat, has governing jurisdiction over the following communities: Colonia Nueva de Guadalupe la Palma, La Pista de los Corredores, Pista Aérea, Tlatel San Juan Xochiaca Parte Alta, and Zapotla. Chimalhuacan have a new park in the center of the municipality, Plaza Estado de Mexico Chimalhuacan, with a library, theater and other places for enterteiment. 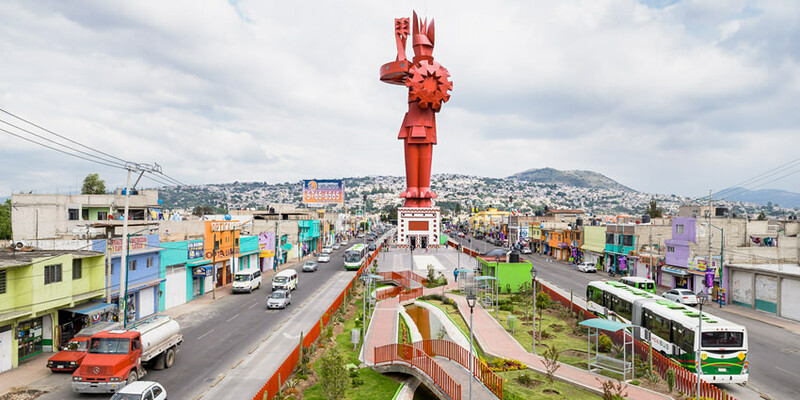 In the entry of municipality has a monument to Chimalhucan, called Guerrero Chimalli, a monument and his height of copper statue are 62 meters. The municipality has an area of 46.61 km² (17.996 sq mi). The adjacent municipalities are Nezahualcóyotl, Atenco, Texcoco, Chicoloapan, and La Paz. The city is the sixth largest in the state in population (after Ecatepec de Morelos, Nezahualcóyotl, Naucalpan de Juárez, Toluca, and Tlalnepantla de Baz). Chimalhuacán is an archeological site located in the city and municipality of Chimalhuacán Atenco in the eastern part of Mexico State, Mexico. It lies just outside the northeast border of the Federal District (Distrito Federal). The name derives from the Nahuatl words “chimalli” (shield), hua (possession particle) and can (place), this would mean “Place of Shields”. The ancient name of the city by its founders was “Chimalhuacantoyac”.The word Atenco, is also Nahuatl; A, “water”; tentli, “lip” and co, “place”, hence would mean “at the water side”. The Chimalhuacán glyph appears on the Quinatzin codex, symbolizing a round shield on a hill, has an alternate interpretation, the name Chimalltepetl = “Hill shields” or “shields site”; most probably referring to the “Chimalhuache” hill, mountain located within the municipality and near the site. It is considered one of the cradles of Mesoamerican civilization due to the finding in 1984, of the “Chimalhuacán Man”, whose remains are some 12,000 old.